This is curious. Recently Steam users (myself included, after a few tests) discovered that certain torrent links no longer work in Steam chat. Some have even reported messages disappearing altogether. Here's the thing, though: it only applies to some popular torrent sites, but not others like The Pirate Bay. Steam, as frequent users are likely aware, has a built-in instant messenger chat service ala Google or Facebook. Some people use it to communicate between games, but for those who eat, drink, and breathe Steam (not to be confused with my new fad diet, which advises people to eat, drink, and breathe steam), it's a way of keeping in touch with far away friends and acquaintances. Sometimes that might involve sharing links that could be considered... somewhat unsavory in nature. Granted, torrents are not inherently illegal, a fact that's led to much uproar over the recent attempted closure of torrent sites due to copyright laws. KickassTorrents, one such site that recently found itself under fire, is at the heart of Steam's sudden blocking spree. And yet, weirdly, torrent kingpin The Pirate Bay isn't blocked or censored. In fact, running down a list of the ten most popular torrent sites of last year, I found that fewer than half are blocked. I've asked Valve what exactly their methodology is here, and I'll update this post if I hear back. 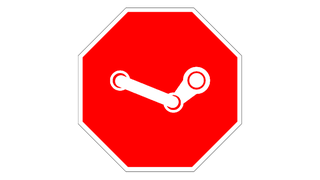 In the meantime, it is worth noting that some sites do host illegal torrents of games, which would provide Valve with a solid reason to put them on their shitlist. Spammers could make use of torrent links too, although I figure Valve would want to shut down links in more public discussions (read: forums, profile pages, etc) rather than chat if that were the case. Beyond that, torrent sites tend to be infested with less-than-trustworthy links, pop-ups, and ads, so Valve might not want to be held liable for whatever comes of that. Alternatively, Valve might be trying to steer away from the ongoing legal drama surrounding sites like KickassTorrents. It's tough to say for sure, especially given the seemingly arbitrary nature of it all. On the upside, maybe Valve will eventually use this tech to stop spam messages from showing up. Some people, however, are worried that we're on the precipice of a new age of Steam censorship. I think they're jumping the gun for now, given that we have zero evidence of that. In these cases it's always good to keep a watchful eye out, but there's no need to panic. Not yet, anyway.